The roof on your home or business is one of the most important features, and caring for it is not always easy, especially when it is old and has sustained damage from unfortunate weather conditions. At Allstate Roofing, we can provide you with full, quality roofing services in Tempe to ensure that your roof remains strong and durable for a long time to come. With shingle, tile, asphalt, and foam roofing services for both commercial and residential properties, Allstate Roofing is five star reviewed on both Google and Yelp and has an A+ rating with the BBB. Trust our roofing contractors to take care of your roof. When your roof becomes damaged and you need top rated roofers in Tempe to repair it with ease. Trust the roofing contractors at Allstate Roofing. For new roof installations in Tempe, AZ, contact the top rated roofing contractors at Allstate Roofing to install your new tile, shingle, or foam roof. Allstate Roofing is a certified shingle roof installer in Tempe, and can repair or replace your shingle roofing to ensure that it is durable and long lasting. As one of the most common roofing types in Arizona, getting tile roofing in Tempe is easy when you trust the professional roofers at Allstate Roofing. For roofing contractors in Tempe, Arizona who are qualified to install and repair shingle, tile, metal, or foam roofing for commercial and residential properties, contact the roofers at Allstate Roofing. Family owned and operated, Allstate Roofing has an A+ rating with the Better Business Bureau and five star reviews on Google and Yelp. Our clients love our work, and with free roofing estimate in Tempe, it’s hard not to see why we are a highly requested and trustworthy roofing company! For more information about our variety of roofing services in Tempe, contact Allstate Roofing today! Related Blogs – Allstate Roofing Inc.
What is a Glendale Tile R&R? I Have My New Phoenix Roof! Now What? What Damages Your Peoria Roof and What Doesn’t? Tempe, AZ is a vibrant city in the East Valley. Home to Arizona State University, the Sun Devil and Diablo Stadium, there is always something to see and do. Tempe is very popular with students, visitors and residents alike, because of its enormous cultural heritage and diversity. Tempe Town Lake is a public lake, generally used to recreational purposes, but also serves to prevent flooding in the Tempe area. 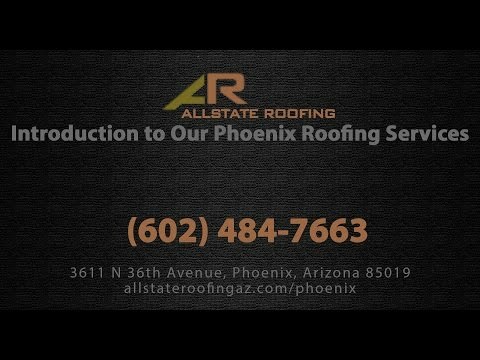 Allstate Roofing has been taking care of Tempe’s roofs for over a decade. Chad and Kathy Thomas have started Allstate Roofing in 2001. Their great reputation has grown along with the company. A second generation roofer, Chad has learned his roofing skills and customer service commitment from his father. Allstate Roofing understands that in order to provide excellent roofing services, you have to provide quality roof repair combined with great customer service. If you are looking for a roofing option that delivers, you should consider a Tempe Foam Roof. Polyurethane Foam Roofs have some truly great properties. Thanks to their liquid application, they are seamless and basically impenetrable by rain and water, while also having superior insulating properties. Additional benefits include an excellent lifespan paired with minimal maintenance. While foam roofs may not be the most popular roofing solution, they sure are a fantastic choice for Tempe commercial and residential roofing structures. Allstate Roofing specializes in the install, repair, and maintenance of SPF roofs. Shingle Roofs have come a long way. The many color choices available today make shingles a very attractive and valid option for those who need to stay within a certain budget. Tempe Shingle Roofs are reasonably priced and will last anywhere from 15-25 years. Because of their low price point they are also more prone to damages from wind and rain storms. If you notice that your shingle roof is leaking or that you are missing shingles or your roof is suffering from excessive loss of granules, contact your Tempe Shingle Roofer today to check on the damage and execute necessary repairs on your damaged shingle roof. If you have ever traveled through Europe, you will have noticed that tile roofs can last for a really long time. If properly installed and taken care of, your Tempe Tile Roof should have a lifespan of at least 100 years. Tile roofs are resilient, insulating and even reflect the hot Arizona sun, keeping you cooler in your home. Plus, they just look great. If your tile roof is damaged or leaking, you need an expert to assess the damage and fix your roof. Allstate Roofing has Tempe Tile Roofing Contractors who will check out the damage, and devise a plan to get your roof back on track and keep you dry-and cool. Allstate Roofing also does new tile roof installs. If your Tempe roof is in need of repair, new tiles, replacement shingles or a foam roof inspections, the expert roofers at Allstate Roofing can help. We only work with quality materials and offer competitive rates. Don’t let a small roofing problem turn into a big one. Waiting to have roof repairs executed on your roof will only end up costing you more down the road and puts unduly strain on your roof and home.